What Are Poker Bank Tools? If you’re playing online poker and don’t know what Poker Bank Tools are, you’re missing out and this is the perfect post for you. Poker Bank Tools are exactly what they sound like: Poker instruments that will help you perfect your poker strategy. And guess what? Most of the Poker Bank tools are actually free tools. In my experience, there’s a before and after the day that I started implementing them in my game. Playing poker became a whole new experience. Since they can really make a difference in your game, make sure you take a look at them and hopefully use them. 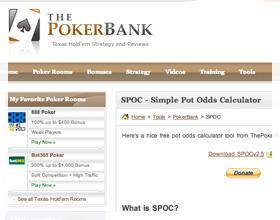 SPOC is the abbreviation of Simple Pot Odds Calculator. It allows you to quickly input bet and pot sizes to work out your pot odds on the fly. It’s an ideal tool for any beginner players that want to get to grips with using pot odds during play. The Fergulator tells you the maximum amount of money you can afford to buy in for in cash games and tournaments, as well as when you should leave the table after winning a set amount of money. Just input the size of your bankroll in to this calculator and Fergulator will do the rest. hoRatio is a percentage odds to ratio odds converter (and vice versa). Ratio and percentage odds are used interchangeably in online poker, which can get confusing if you’re not amazing at maths. HoRatio will do the math for you. CHIMP is an ICM calculator. If you’re into playing tournaments, you’ll want to find out what ICM is and how to use ICM during play. It’s a pretty important concept for any SNG or MTT player. There are a number of online ICM calculators out there, but this is the only downloadable one. APE is a tournament M and Q calculator. If you want to find out the M and Q for multiple players at a time during or after an MTT or SNG, just plug the stack sizes in to APE and it will work them out for you. Working out M and Q by hand is straightforward, but if you want to quickly get a visual display of M and Q for multiple players, APE is a better option. Advice on how to play at the level you are bankrolled for. It’s a little different to the Fergulator tool, since the Fergulator tells you how much you can safely buy in for at any level and when you should cash out. Quickly convert between percentage odds and ratio odds with this web-based poker odds converter. It does exactly the same job as hoRatio – this is just like an online version. This calculator estimates how long it will take before you can move up to the next level (or next “stakes”, whatever you want to call it) based on a few simple variables. This particular tool is actually within a larger article, so just scroll down to the middle somewhere and you’ll find it. This information was an update from the Poker Bank. We hope you enjoy these tools and hopefully serve you to become a more frequent poker winner.